Mataeopsephus Waterhouse, 1876: 16-18 (orig. descr.). Type species: Mataeopsephus nitidipennis Waterhouse, 1876 after monotypy. 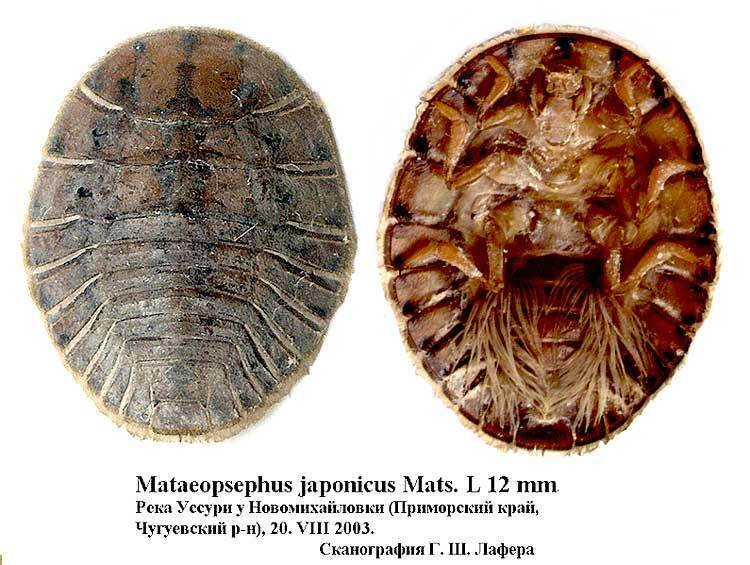 Mataeopsephus: Lee, Jach & Sato, 2003: 481-517 (revision). Mataeopsephenus (unjustified emendation): Zaitzev, 1908:4; 1910: 14. Bollow, 1938: 153. Miyamoto, 1953a: 3; 1953b: 3. Shiraki, 1954: 473. = Betelmis Matsumura, 1916: 5 (orig. descr.). Type species: Betelmus japonicus Matsumura aftere motypy. Betelmis: Bollow, 1938: 164. Sato, 1970a: 7. Brown, 1981: 143. = Sinopsephenus Nakane, 1964: 50 (orig. descr. ; subgenus of Psephenus). Type species: Psephenus (Sinopsephenus) chinensis Nakane, 1964 after orig. des. and monotypy. Synonymized in Lee, Jach & Sato, 2003. Sinopsephenus: Brown, 1981: 143 (as genus). Lee & Jach, 1995:350. According to last revision (Lee, Jach & Sato, 2003) now this genus includes 12 species [chinensis (Nakane, 1964), dentatus Lee, Jach & Sato, 2003, esakii Nakane, 1964, japonicus (Matsumura, 1916), maculatus Nomura, 1957, minimus Lee, Jach & Sato, 2003, nitidipennis Waterhouse,1876, quadribranchiae Lee, Jach & Sato, 2003, sichuanensis Lee, Jach & Sato, 2003, taiwanicus Lee, Yang & Brown, 1990, tenuipes (Champion, 1921) и vietnamensis Lee, Jach & Sato, 2003]; 8 of them occur in China, 3 in Japan, 1 in Primorskiy Terr. Of Russia, 1 in Korea and 1 in Vietnam. M. japonicus (Matsumura)(= coreanicus Del.) was find in Korea and Primorskiy Terr. Личинки описаны для большинства видов: chinensis, esakii, japonicus, quadribranchiae, maculatus, nitidipennis, sichuanensis, taiwanicus и vietnamensis. Lee C. F., Jach M. A. & Sato M., 2003. Psephenidae: Revision of Mateopsephus Waterhouse (Coleoptera). // Water beetles of China. Vol. III. Ed. M. A. Jach & L. Ji. P. 481-517.